How did the most wanted man in the country outwit the greatest manhunt in British history? In January 1649, King Charles I was beheaded in London outside his palace of Whitehall and Britain became a republic. When his eldest son, Charles, returned in 1651 to fight for his throne, he was crushed by the might of Cromwell’s armies at the battle of Worcester. With 3,000 of his supporters lying dead and 10,000 taken prisoner, it seemed as if his dreams of power had been dashed. Surely it was a foregone conclusion that he would now be caught and follow his father to the block? At six foot two inches tall, the prince towered over his contemporaries and with dark skin inherited from his French-Italian mother, he stood out in a crowd. How would he fare on the run with Cromwell’s soldiers on his tail and a vast price on his head? The next six weeks would form the most memorable and dramatic of Charles’ life. Pursued relentlessly, Charles ran using disguise, deception and relying on grit, fortitude and good luck. He suffered grievously through weeks when his cause seemed hopeless. He hid in an oak tree – an event so fabled that over 400 English pubs are named Royal Oak in commemoration. Less well-known events include his witnessing a village in wild celebrations at the erroneous news of his killing; the ordeal of a medical student wrongly imprisoned because of his similarity in looks; he disguised himself as a servant and as one half of an eloping couple. Once restored to the throne as Charles II, he told the tale of his escapades to Samuel Pepys, who transcribed it all. 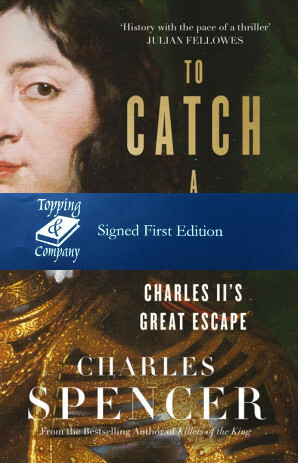 In this gripping, action-packed, true adventure story, based on extensive archive material, Charles Spencer, bestselling author of Killers of the King, uses Pepys’s account and many others to retell this epic adventure.